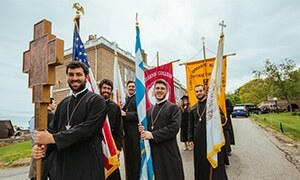 The Library’s resources are intended primarily for students, faculty, staff and alumni of Hellenic College and Holy Cross Greek Orthodox School of Theology. Students and faculty currently affiliated with Newbury College and the Boston Theological Institute (BTI) also have access to Library materials. Visiting scholars and other guests may consult the collections but do not have borrowing privileges. The Library’s computers are for research, academic and institutional use. Hellenic College and Holy Cross users have priority. Those individuals observed using the computers for inappropriate behavior will be asked to leave the Library, and if they are affiliated with Hellenic College Holy Cross, they will be reported to the Administration. $0.25 per day per book. $0.25 per day for recalled books. Books may not be borrowed if you owe $10 or more in fines or have more than two books overdue. For a lost book the minimum charge is the cost of replacement and a $20 processing fee. Books may be renewed twice unless a hold has been placed on the item by another patron. Books may be renewed either online or at the circulation desk. A book may be recalled after it has been checked out for 7 days. Reserve materials are limited to a two (2) hour check out and are for use only in the Library. Reserve materials may be renewed if no other patron needs an item. A valid ID must be presented. The ID card will be kept at the Circulation Desk while Reserve materials are used. The BTI allows graduate students and faculty of Holy Cross Greek Orthodox School of Theology (but not the undergraduate students of Hellenic College) to use the collections of the libraries, either in person or through the BTI Courier, who delivers books to member libraries at the request of a patron. When visiting one of the BTI libraries, the graduate students and faculty members of Holy Cross Greek Orthodox School of Theology must present BOTH their current school ID AND the current semester BTI card (obtained from their own institutional library director). Items checked out from BTI libraries may be returned via the courier. Further information about the member libraries of the BTI can be found on the BTI Libraries website. Students of Hellenic College have library privileges at the nearby Newbury College Library. Inter-library Loan services are available to HCHC students, faculty, and staff for materials located in other libraries. Photocopied Inter-library Loan material is .20 per page. There may be a charge for some materials.